Let this therefore be an undoubted article of thy faith: not of a history faith, as thou believest a gest of Alexander, or of the old Romans, but of a lively faith and belief, to put thy trust and confidence in, and to buy and sell thereon, as we say; and to have thy sins taken away, and thy soul saved thereby, if thou hold it fast; and to continue ever in sin, and to have thy soul damned, if thou let it slip; that our Jesus, our Saviour, that saveth his people from their sins, and our Christ, that is our king over all sin, death and hell, anointed with fulness of all grace and with the Spirit of God, to distribute unto all men, hath, according unto the epistle to the Hebrews and all the scripture, in the days of his mortal flesh, with fasting, praying, suffering, and crying to God mightily for us, and with shedding his blood, made full satisfaction both a pœna et a culpa1 (with our holy father’s leave) for all the sins of the world; both of theirs that went before, and of theirs that come after in the faith; whether it be original sin or actual: and not only the sins committed with consent to evil in time of ignorance, before the knowledge of the truth, but also the sins done of frailty after we have forsaken evil and consented to the laws of God in our hearts, promising to follow Christ and walk in the light of his doctrine. He saveth his people from their sins, Matth. 1, and that he only: so that there is no other name to be saved by. Acts 4. And “unto him bear all the prophets record, that all that believe in him shall receive remission of their sins in his name.” Acts 10. And by him only we have an entering in unto the Father, and unto all grace. Eph. 2 and 3 and Rom. 5. And as many as come before him are thieves and murderers, John 10; that is, whosoever preacheth any other forgiveness of sin than through faith in his name, the same slayeth the soul. This to be true, not only of original but also of actual [sin], and as well of that we commit after our profession as before, mayest thou evidently see by the ensamples of the scripture. Christ forgave the woman taken in adultery, John 8 and another whom he healed, John 5. And he forgave publicans and open sinners, and put none to do penance, as they call it, for to make satisfaction for the sin which he forgave through repentance and faith; but enjoined them the life of penance, the profession of their baptism, to tame the flesh in keeping the commandments, and that they should sin no more. And those sinners were for the most part Jews, and had their original sin forgiven them before through faith in the testament of God. Christ forgave his apostles their actual sins after their profession, which they committed in denying him, and put none to do penance for satisfaction. Peter (Acts 2) absolveth the Jews, through repentance and faith, from their actual sins, which they did in consenting unto Christ’s death; and enjoined them no penance to make satisfaction. Paul also had his actual sins forgiven him freely, through repentance and faith, without mention of satisfaction. Acts 9. So that, according unto this present text of John, if it chance us to sin of frailty, let us not despair; for we have an advocate and intercessor, a true attorney with the Father, Jesus Christ, righteous towards God and man, and [he] is the reconciling and satisfaction for our sins. 1. Latin for "from guilt and punishment"
2. Tyndale, W. (1849). Expositions and Notes on Sundry Portions of the Holy Scriptures, Together with the Practice of Prelates. (H. Walter, Ed.) (Vol. 1, pp. 153–156). Cambridge: Cambridge University Press. Why do people think the Mosaic law was hard to keep? In general, it is because they do not know what the law really commanded, and because they have the Mosaic law confused with the rabbinical traditions of Judaism. 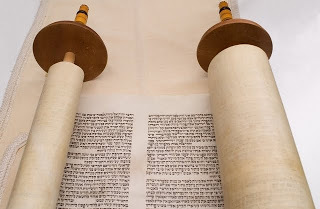 The rabbinical traditions were a "heavy yoke" (Matthew 15:1-20; Mark 7:1-23; Acts 15:10; Matthew 23:4). Jesus called the people back to the Mosaic law, making it his own, and in doing so said that He was offering an "easy yoke" (Matthew 5:20-48; 11:29-30). We should, then, briefly look at the Mosaic law. What about all those sacrifices, you may ask? There were the Burnt, Meal, Peace, Thank, Votive, Sin, Reparation, "Heave," and "Wave" Offerings, for starters. Some used salt, and some did not. Some used oil, and some did not. Some required a lamb; others, oxen; others, birds. Leavened bread was used with some, unleavened with others. Some parts of the animal were burned up, others given to the priests, and others were eaten by laymen. These things differed for each sacrifice. It was an awful lot of detail to master. The Israelite citizen, however, never offered any sacrifices himself. Only the priests were allowed to do the sacrifices, and they did them every day. They soon became familiar with all these details. Compare the details of the complicated sacrificial system with the details of auto repair, and it suddenly becomes clear just how simple the priests's job was. How many different kinds of cars are there? Add on the fact that they change from year to year. Now consider all the different parts and aspects that can go wrong. Next time you take your car in, look at all the volumes of "Chilton" auto repair manuals that your mechanic keeps on hand, and compare their size and detail with the book of Leviticus. If your mechanic can learn to fix cars, and enjoy it, obviously the priests of Israel had no trouble managing the sacrificial system. What about the sabbath? Wasn't that a burden? No, it was a time of rest. But weren't they forbidden to cook on the sabbath? No, they kept the sabbath as a feast. But weren't they forbidden recreation on the sabbath? No, the Bible nowhere says this. Well then, what did they do? They went to church to worship God (Leviticus 23:3), and relaxed the rest of the day. The sabbath was not an "impossible burden." What about all those cleansing rules in Leviticus 11-15? Well, in the first place, becoming unclean only meant one thing: You were not permitted to go into the forecourt of the Tabernacle and bring a sacrifice. Since most forms of uncleanness only lasted a day or a week, it was no real burden to be unclean. Second, if you were seriously unclean, you could make other people unclean for a few hours (until sundown) if you touched them; but again, that was only a matter of concern if the other person were on his way to offer a sacrifice. At the most, being unclean was an inconvenience. Of course, if you were unclean for months on end, and could not attend festivals, it became a more serious matter. The laws of uncleanness were not hard to keep. You were to wash out a pot if a lizard fell into it and died. We would do the same today. You were not supposed to marry your sister, aunt, or child. Few of us would be tempted to. You were not supposed to eat dog-burgers or salted roast roaches. Most of us wouldn't either. That is because these are our customs, and we don't find them burdensome. If we were used to eating dog meat, as some cultures do, then the restriction would be temporarily burdensome until we got used to it. The Jews were not to eat pork either, but that was not hard for them. They were no more tempted to eat pork than we are to eat roaches. "I will show him how much he must suffer for the sake of my name." 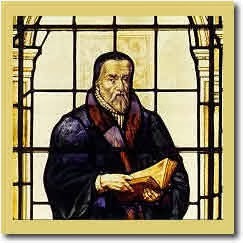 John Calvin & Isaiah 64:6 -- "All our righteousness is as filthy rags"
Some commentators torture this passage, by alleging that the Prophet, when he speak of the pollutions of sins, describes the Jews without exception, though there still remained some of them who were sincere worshippers of God. But there are no good grounds for this; for the Prophet does not speak of individuals but of the whole body, which, being trodden under foot by all men, and subjected to the utmost indignity, he compares to a filthy garment. 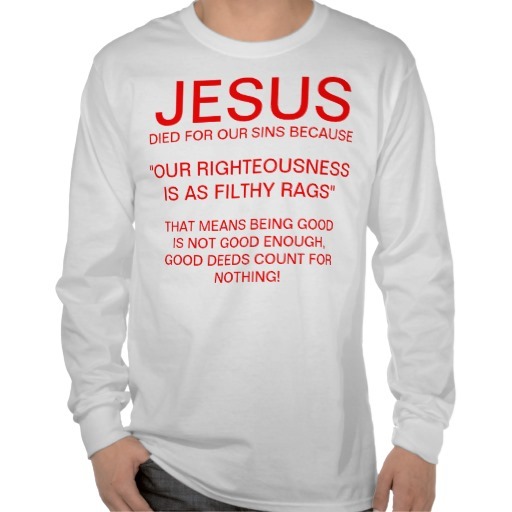 We have all become like one who is unclean, and all our righteous deeds are like a polluted garment. We all fade like a leaf, and our iniquities, like wind, take us away. Introduction: "Then [Jesus] began to denounce the cities... because they did not repent." A) "Woe to you... Woe to you!" B) "For if the mighty works done in you had been done in..."
C) "But I tell you... it will be more bearable on The Day of Judgment ...than for you." B') "For if the mighty works done in you had been done in..."
C') "But I tell you... it will be more tolerable on The Day of Judgment ...than for you." It's interesting that Jesus mentions Tyre and Sidon. By doing so, he compares the Jew-saturated cities of Bethsaida and Chorazin with two Gentile-saturated cities. Surely this was no accident. At this point in Matthew's gospel, Jesus had not yet visited Tyre or Sidon (which is northwest of Galilee, along the coast of the Mediterranean Sea). Therefore Tyre and Sidon had not yet seen the mighty works which Jesus had done. But they will. As noted in a previous post (see E and E'), Jesus visits the region of Tyre and Sidon once (in 15:21-28) and the faith on display in that region --from a Canaanite nonetheless!-- is exponentially greater than the faith of the Pharisees here in chapters 11 & 12. Jesus is on a mission to conquer the land for his name's sake and claim a people for himself, and if Tyre and Sidon had seen the mighty works which Jesus had done around the sea of Galilee, they would have repented. But woe to the Jews around Galilee who will suffer God's wrath because they would not repent and find rest in him. Jesus gives them a “sign” (part one): “An evil and adulterous generation seeks for a sign. And just as Jonah the prophet was in the belly of a “Sea-monster”1 for three days and nights, “so will it be” (outos estai) for Israel’s prophet, the Son of Man, in the heart of the “Land”2 (of Israel) for three days and nights. Jesus gives them a “sign” (part two): When an unclean spirit goes-out of a man and goes-through waterless places to seek "rest," it finds no rest. But when it goes back and finds it’s “house” empty, clean, and in order, it goes and brings seven other spirits more evil than itself back into its "house." The last of that man becomes worse than the first. “So will it be” (outos estai) with this evil generation. At first glance, it's not obvious what kind of a "sign" Jesus is giving these scribes and Pharisees. But it is obvious that Jesus is giving them some kind of sign, even though he starts off by telling them that an evil generation, i.e. a generation like them, seeks after "signs." Jesus then proceeds to offer what seems to be a two-part "sign". The first part is about a prophet named Jonah with whom every first century scribe and Pharisee was familiar. They knew Jonah was the only prophet in Israel's history whom Yahweh sent to a Gentile nation --the nation of Ninevah. And here, Jesus compares himself to Jonah, and the "evil generation" before him is compared with the Ninevites. 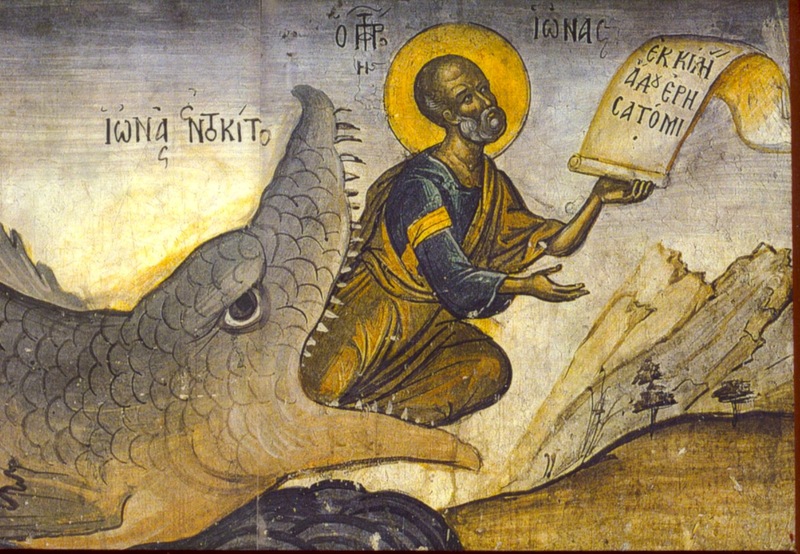 Just as Jonah was swallowed up by a Sea-monster and delivered three days later to teach for forty days a message of repentance and faith to the Ninevites, so Jesus will be swallowed up in the heart of the land of Israel and delivered three days later to teach for forty days about the kingdom of God to the Jews (Acts 1:3). Jesus then moves on to his central point: a description of wisdom among the Gentiles. It's as though, when Gentiles accept wisdom they are accepting salvation as well. How much more would this be true for the people of Israel who have Wisdom-personified in their midst? Jesus says that the people of Ninevah understood wisdom when they saw it. They knew Jonah was a great prophet of Yahweh, and they repented because of Yahweh's messenger. For that reason, Jesus says those Gentiles (i.e. Ninevites) will rise up at The Judgment to pronounce a verdict along with Jesus against Israel's unrepentant Jews --Jews who end up rejecting a greater prophet than Jonah. The queen of the south (i.e. of Sheba, I Kings 10:1-10) also understood wisdom when she heard it. She too understood that Solomon was a great Prophet-King of Yahweh, and she even traveled from the outer-limits of the land (around Egypt and Ethiopia) to listen to the wisdom of Yahweh's Prophet-King. For that reason, Jesus says that she will rise up at The Judgment to pronounce a verdict along with Jesus against Israel's unrepentant Jews --Jews who end up rejecting a greater Prophet-King than Solomon. Concluding the second part of this "sign" which the scribes and Pharisees requested, Jesus moves on from talking about himself, to talking about "this evil generation" again. It is "this evil generation," Jesus says, that has a "house" with a "man" in it; and that man/house has an unclean spirit. Then comes a day when that unclean spirit leaves its "house" to find rest somewhere else. The "little children" of Israel have been searching for rest for a long time, and have finally found it in Jesus (11:25-30). 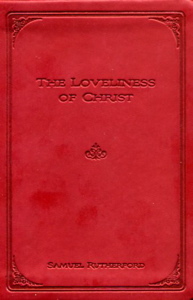 But such revelation has been hidden from "the wise and understanding", i.e. the scribes and Pharisees. Their disciples are like those who leave their house for rest somewhere else, passing by the water-filled location of rest that is found in Jesus. They don't want the rest which Jesus offers. And so, after a while the unclean spirit returns and find its house cleaned up and put back in order by the man of the house. But it doesn't like the way the house has been cleaned up; and so seven more evil spirits are gathered together to return to this man's cleansed house, making it worse than it was at first. Little do they know that Jesus owns everything in the world, and is the master of the house in which this man lives; and if seven evil spirits worse than the first return into his house, making it seven times more unclean than it was at first, he won't come back to clean it up and make it look pretty inside again. He'll return to break down the house, its stones and timber, and all the plaster of the house (Lev. 14:43-45), and it will be delivered over to a place outside the city of God, to an ash heap of uncleanness forever. 1. The Greek word translated as "great fish" literally means "Sea-monster," and is used throughout ancient Greek literature in reference to sea-monsters, not merely "great fish." 2. The Greek word translated as "earth" is misleading. Although it can and often does mean "earth," it rarely means the planet earth. In context, Jesus is simply expressing that the queen of Sheba traveled all the way from the outer limits of the land from Israel came. And Sheba is located around Egypt & Ethiopia, which is the stretch of land from which Israel as a nation came. 3. The Greek word translated as "ends" means "limits" and in context it means the outer-border or outer-limits of the land. It does not mean the other "end" of the physical planet. That would be absurd.